Well, hello there! Can you believe it's nearly December already? This year has just flown by! In my house, Christmas preparations are in full swing. And even though it's only feeling tentatively summery right now, I've noticed a lot more events popping up - both social and blog-related. I guess we're all slowly coming out of our winter hibernation! I've got a few fun invited events and meals coming up on the blog, but for today I'd like to tell you about the Progressive Dinner at South Wharf - a dining experience of five courses with matching wines, that takes you through different eateries in South Wharf. 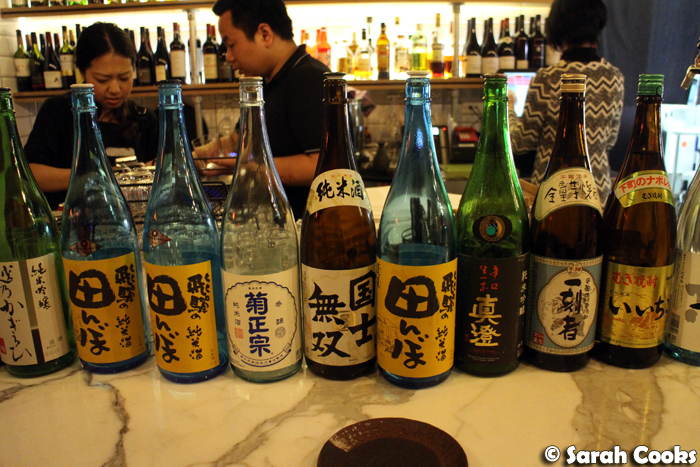 The menu and venues changes each time, but this post will give you an idea of the type of experience you could expect at a South Wharf Progressive dinner. 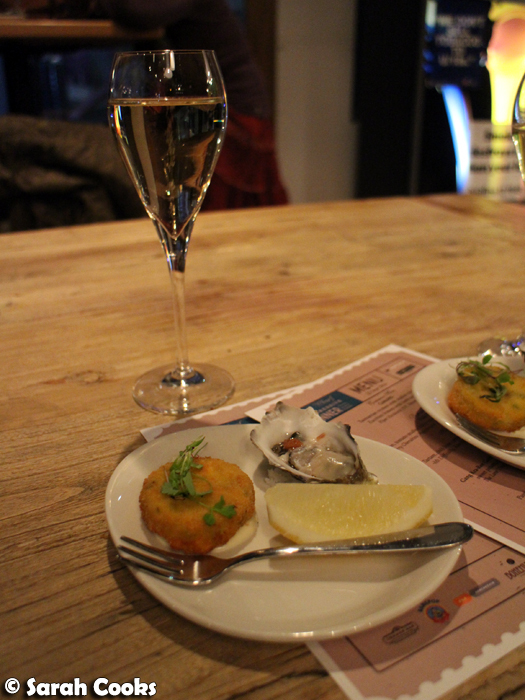 We started with canapés and champagne at Common Man - a briny fresh oyster with shallot vinaigrette, and a lovely crisp zucchini fritter. Both excellent matches for champagne! The second stop was at Bohemian, a cosy Spanish restaurant and bar, for our starter of squid. 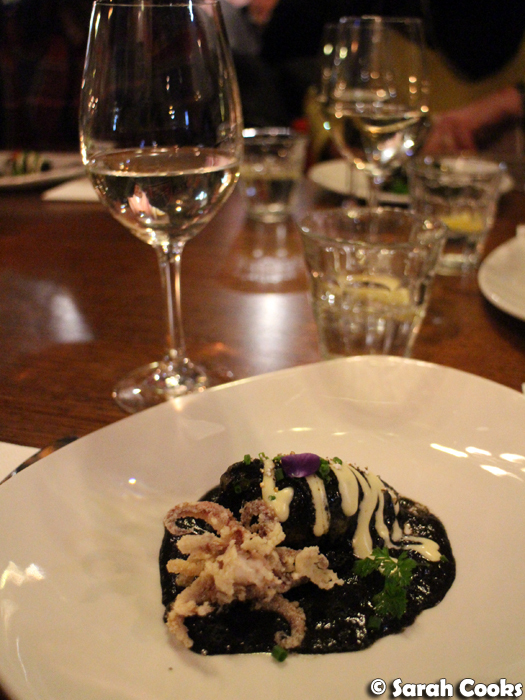 This dish was made up of a baby squid, stuffed with jamon and tomato, doused in a malevolently black squid ink sauce. I absolutely adore squid and squid ink, so I was thrilled with this dish. It seemed very popular at our table too. 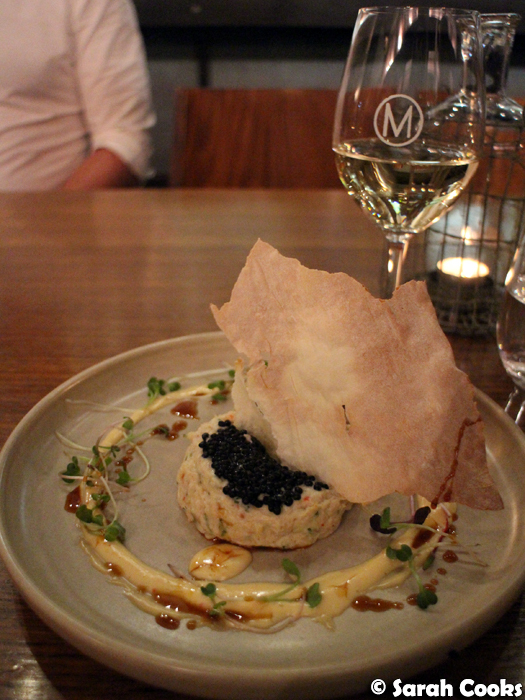 I was surprised that our entrée at Meat Market wasn't, well, a meat dish, but I certainly didn't have any complaints about the crab tartare! The sweet crab meat was mixed with lime-spiked crème fraîche, with addictive salty pops of avurga caviar. With the crisp shard of lavosh, it was a great balance of flavours and textures. 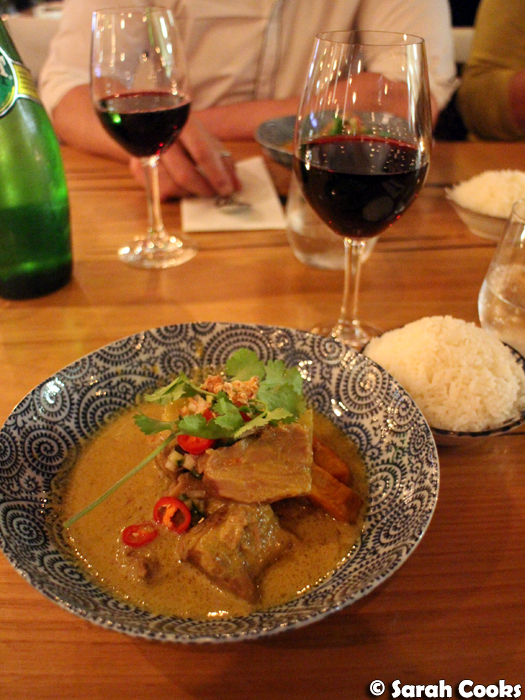 It was a cold evening, so BangPop's main dish of lamb curry really hit the spot. In fact, as soon as we walked into the venue we were hit with the comforting aroma of jasmine rice - lovely! The curry itself was very good - whilst it wasn't overly hot, it had a nice rounded spice to it, and the meat was very tender. I'd definitely order this one again if I were coming to Bang Pop for a meal. I'm normally not confident pairing wines with curry, but the accompanying merlot, with its fruity flavour and fine tannins, matched the spiciness well. And finally, dessert was at Akachochin! 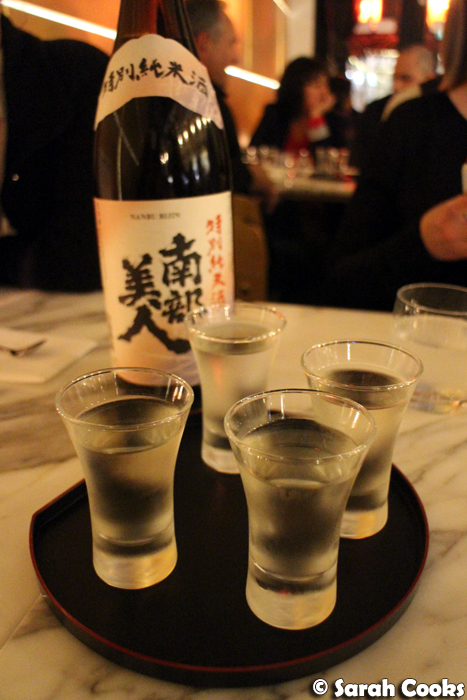 This one was matched with a sake. (My Japanese isn't what it used to be, but I believe that "nanbu bijin" means "beautiful person from the south"). 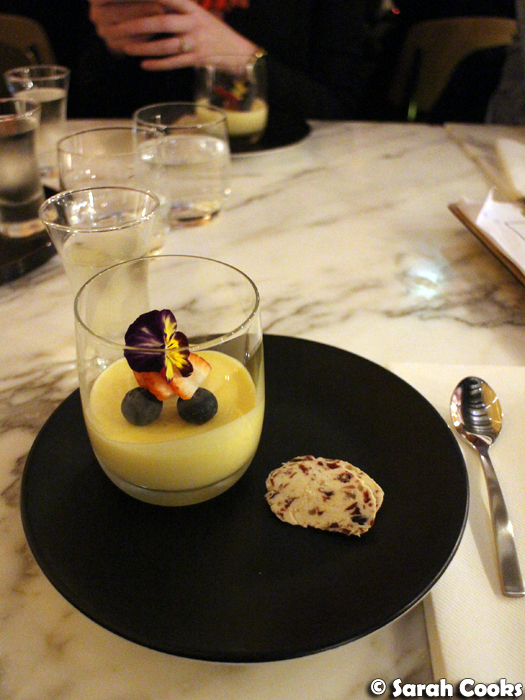 Our dessert was a creamy yet light passionfruit mousse, with umeshu cream cheese. It was a sweet and simple way to end a big meal. It was a really fun evening! Apart from the delicious food, the Progressive Dinner was very well-run - the organisers kept the group moving from restaurant to restaurant on schedule without feeling rushed. A great way to try a lot of restaurants and different cuisines at once! The final Progressive Dinner for the year will be held on Wednesday 30th November, and costs $119 for five courses with matching wines. 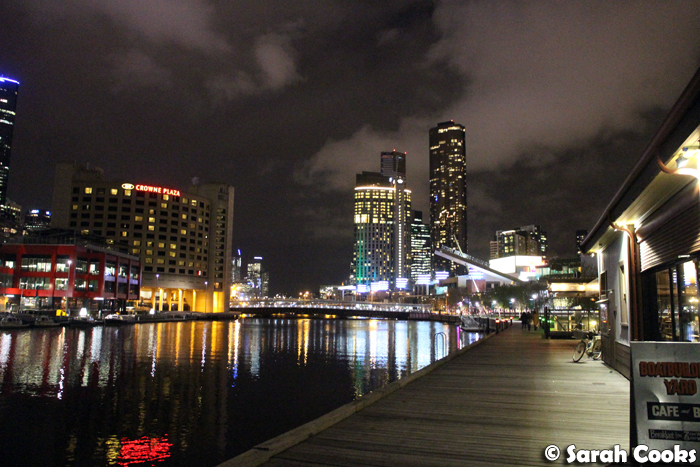 Bookings can be made at the South Wharf Restaurants website. Keep an eye on the website for next year's dates. I was surprised that you got crab at a meat restaurant but like you, I wouldn't complain. There's not enough crab in my life lol. I have noticed something interesting after reading a few of your restaurant reviews. In North America, "entree" would usually be used as a word to describe the main/biggest dish of the meal, but in your reviews, entree and main dish seem to be two different things. How is the term "entree" used in Australia if it isn't an appetizer, but also isn't the main dish? Curious! Ah yes, in Australia we say "entrée" for a first course / starter / appetizer, and the main dish is simply called a main.